Welcome to week 1 of the Beaded Lanterns Quilt Along! 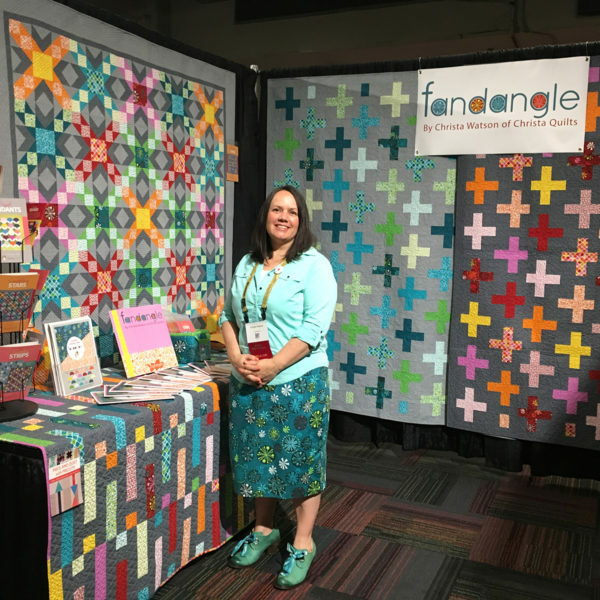 I’m Christa Watson, an author, fabric designer and BERNINA ambassador, and I’m excited to cheer you on over the next 7 weeks as we make a complete quilt from start to finish. 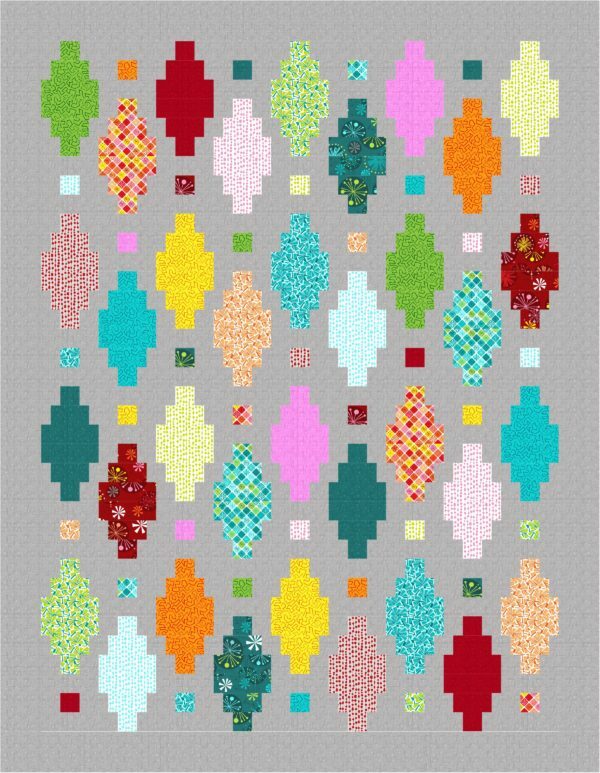 I’m excited to be making my free Beaded Lanterns Quilt pattern that beautifully showcases my my second fabric line, Fandangle, available from Benartex Contempo Studio. It’s currently available and in shops now if you’d like to follow along and make the same version as me. But of course, you can work with any fabrics you like, and this pattern is perfect for scrap busting! As long as you select a contrasting fabric to go along with your colorfu; prints, you’ll have success no matter which fabrics you choose. This week I’ll share the list of materials you need to make the quilt along with the complete schedule for you to follow along. This quilt is super fun to make either by yourself or with a group – the more the merrier! So grab your favorite 2 1/2″ pre-cut strips (jelly roll, strip-pie, pinwheell, roll-up, or whatever they are called) and let’s get going. I’ll be working with one Strip-Pie of Fandangle, plus the coordinating light gray Confetti Crosshatch print. Note: fabrics are based on 42″ wide fabric with at least 40″ of usable length. 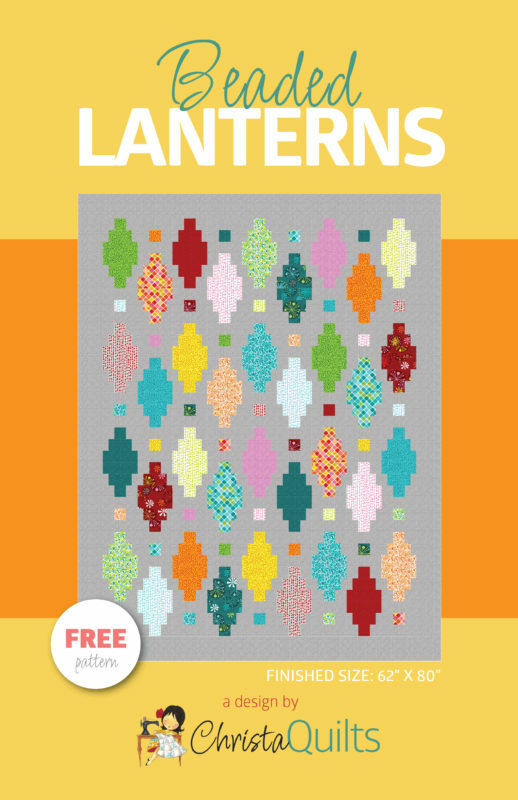 Beaded Lanterns pattern – click here to download from the Benartex website. Click here for a list of shops that have purchased Fandangle from Benartex. More are being added daily! Be sure to share your progress as you make this quilt. You can share pics on the We All Sew community site and on social media with the hashtags #beadedlanternsqal and #berninausa. Tag me @christaquilts so I can see your progress and cheer you on. Please post any questions or comments you have and I’ll be glad to answer as soon as I can. So gather your supplies and we’ll dive into cutting next week. See ya then! Will this post come up each week on Wednesday’s. Christa’s quilt-along will post mid-week. Occasionally, the post schedule might shift by one day. Thank you for quilting along. @ maidmarion ..By looking at the pattern, it looks like the additional yard of the background will form the border around the edge. If you use the 4 yrds instead, the first 3 yrds are for the bckground. I have decided to do this with one of my stash jelly rolls. I have so many and they are so hard to actually use. I think this will be a fun way to use one of them. Now to actually pick one out…Wish me luck! ok…I must have been asleep last year when this was done…now I feel foolish by the comment above..BUT I’m going to go back through and do the steps! I still think it is a fun quilt!